An essential selection of our best offerings. 1/4 lb. classic handmade Truffle Budds, 1/4 lb. Chocolate Pecan Squares, 3 bags of Taste Budds own gourmet coffee in three flavors. Chocolate Raspberry, Hazelnut, and French Vanilla, 2 oz. each. 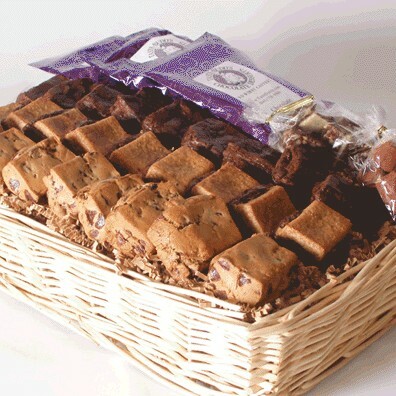 Plus 27 cookie bar miniatures baked to order in the flavors that you select. Arguably the best gift basket value on the web! Basket measures 16"X11"X3".